EasyTurf will be exhibiting at this year’s GIE (Green Industry and Equipment) Expo, held at the Kentucky Exposition Center from October 21st through 23rd. The GIE Expo has proven to be a lively and productive marketplace. The GIE Expo will be taking place in tandem with the Hardscape North American tradeshow. The shared space will allow attendees to enjoy both events simultaneously. The GIE Expo will feature a 19-acre demonstration area and is expected to include 750 exhibits and draw 18,000 participants. The Hardscape North American Expo is the only national trade show devoted entirely to the hardscape industry. In addition to exhibits, the event will feature a new product showcase, seminars, certifications, and networking opportunities. The Virtualrain convention is being hosted by Wolf Creek Company, a landscape distributor based in Louisville specializing in landscape and turf systems. In addition to being a Virtualrain member, Wolf Creek Company is an EasyTurf distributor. 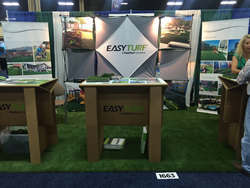 The EasyTurf booth at GIE will feature the brand’s bestselling turf as well as products such as Go Mats and Grab and Go. Go Mat is a new product versatile enough for use in various applications. Portable Go Mats feature a bound edge and are lightweight enough to take anywhere, including the park, beach, and to sporting events. Grab and Go was designed for use in small-scale improvement projects such as kennels, dog runs, and lawns. Both products can be viewed at Booth #3173.